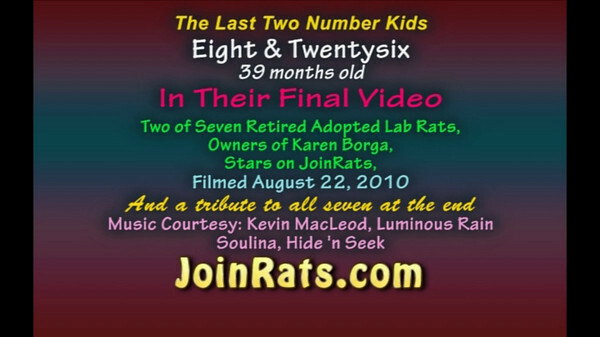 Karen's seven adopted lab rats: Sevnee, Levnee, Ate, Tennie, Tweneefor, Therdyfor, and Therdeeate. 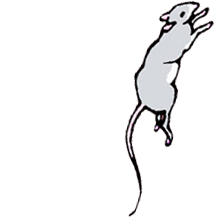 This gallery contains photos and videos of the beautiful black hoodie rats, with Karen and Keith, and visitor Gwen. This video shows Numbers 8 and 26 as best buddies. The fast forward, group film is of Numbers 7, 8, 11, 26, 34, 38 and Jerry. Number Ten had died three months earlier. The Number rats were retired from a lab after being used in behavioral experiments. Jerry is a retired lab who was not used in any experiments.